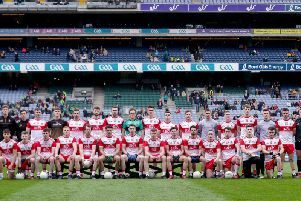 Moortown’s hopes of becoming the fourth club from Tyrone to win the Ulster Minor Tournament in Belfast ended in disappointment at the semi-final stage when they lost out to an impressive Crossmaglen side, 1-6 TO 2-13. The St.Malachys were well in the hunt entering the closing stages of the first half but that’s when the Armagh champions hit a purple patch to establish a grip on proceedings that they never looked like losing. Crossmaglen hit their second goal and tagged on two points to give them a 2-7 to 1-4 interval advantage. Moortown managed only two points in the second half, both frees, as a stronger Crossmaglen side deservedly advanced to the decider. Moortown began brightly, Conan McLernon knocking over a couple of frees, before the superb Rian O’Neill opened the winners’ account. By the end of the opening quarter. the sides were locked together on 0-4, Callum Gallagher and James Devlin exchanging points with Colin O’Connor, Michael McCabe and O’Neill. Crossmaglen then struck for their first goal from McCabe, and they almost got in for another major moments later but O’Neill’s pile driver came back off the crossbar. O’Neill added a point before Moortown hit back as Shaun Conway found the net. At that stage only the minimum separated them, but Crossmaglen enjoyed a blistering last five minutes to the opening period that included a goal from O’Neill to leave them well in control. Moortown needed a good start to the second half but Crossmaglen picked up where they had left off with McCabe and O’Neill tagging on points. McLernon replied with a Moortown point but they were to score just once more. The winners were on top in key areas of the field and closed the game out with points by Oisin O’Neill and O’Connor to move to within sixty minutes of emulating their senior counterparts.